When a T cell encounters a foreign antigen, the resting T cell becomes activated. Activated T cells secrete IL-2 and express IL-2 receptors. 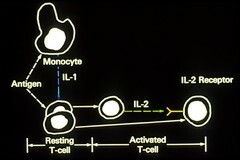 IL-2 promotes the growth of normal T cells, which help defend the body against cancer.